I moved my stethoscope around on Eileen’s belly, listening carefully for any abnormal gut sounds. All was well with the Paint mare, her intestines producing all of the musical and healthy sounds of a functional GI tract. Her belly was huge and bulged out dramatically, giving her the appearance of a torpedo with legs. I ran my hand under her belly and gently palpated her udder. It was enlarged but firm, and there was no milk evident yet. Kenneth, the owner, looked like he hadn’t slept in a few nights. I explained that I couldn’t hear the foal over the normal sounds of the intestinal tract, but the mare was clearly not ready to start labor. I didn’t see any reason to palpate Eileen rectally, but I did pull out the ultrasound and get it assembled and turned on. Kenneth watched anxiously as I soaked the mare’s abdomen with alcohol and applied a large probe to her belly. Her uterus appeared on the ultrasound screen, along with a small amount of amniotic fluid, a nice transverse view of the placenta, which looked healthy, and the foal, which seemed to be running a race inside of his mother. I assured Kenneth that I could only see evidence of a single foal, sometimes difficult to do in a late-term pregnancy due to the size of the fetus. For good measure, I located the thorax and was able to get a fetal heart rate, as well as a good view of normally developing ventricles and atria, the cardiac valves opening and closing crisply. All was well with the little creature, but Kenneth wasn’t easily reassured. Since I’d artificially inseminated the mare, I knew her conception date. 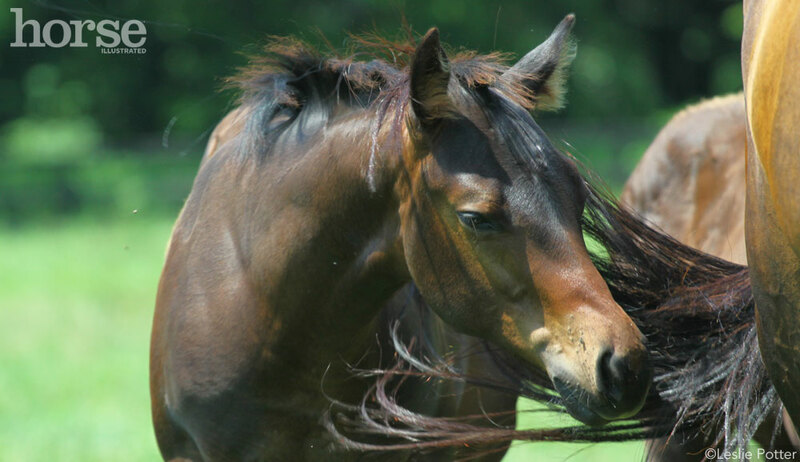 I always tell the client that the due date is merely a suggestion routinely ignored by mares, but many owners get hung up on the numbers and expect a foal right on the circled date on the calendar. Kenneth was going to be one of those owners, despite my attempts to educate him. We’d gone over signs of impending labor, gestation lengths that don’t always obey the 345-day mark, and signs of maternal and fetal distress, but it just wasn’t sinking in. Eileen hadn’t lifted her head from the hay feeder. I wasn’t about to give drugs to a perfectly healthy pregnant mare, so I suggested a sugar- and starch-free mineral and protein block that would buffer stomach acids. Kenneth fussed, but agreed to order the block, and was on the phone as I drove away. That night, the phone rang. I put the phone down. A few minutes later, it rang again. Wearily, I told Kenneth to go ahead and book the massage, and snickered at the thought of asking him to book me one too. I didn’t hear from him for a few days. Then he called again. I agreed to come look at Eileen again, and when I arrived, she was licking at the new block happily. I checked her over, and found nothing out of the ordinary but her udder was a little bigger, and when I gently squeezed one of her teats, a bead of thick yellow fluid appeared. Her tailhead was soft and her belly had dropped several inches. I figured we had no more than 48 hours left. Kenneth’s cot was in the breezeway, and there was a small table with an essential oil diffuser puffing aromatic mist into the air. Several books and a flashlight were on the cot. I shook my head and packed up my things. As I drove away, I could see Kenneth sagging at the stall door, and I had a feeling that I knew what was coming. Sure enough, the next morning the phone rang and Kenneth was in tears. I drove out to the barn and consoled Kenneth. Mares are secretive about foaling, and many an owner who’d stayed up too many nights staring at their pregnant horse had missed the big event on the one night they’d fallen asleep. Eileen and her foal were happy and healthy, and I could have sworn that she winked at me as I was examining the baby. Of course, Kenneth had some final thoughts. Courtney S. Diehl, DVM, has been an equine veterinarian since 2000. She resides in Steamboat Springs, Colo., where she is in private practice. Her first book, Horse Vet, Chronicles of a Mobile Veterinarian, was published in 2014, and she is currently at work on her second book.